Matthew 5:13-16 “You are the salt of the earth….You are the light of the world, a city on a hill that cannot be hidden…..let your light shine before men, that they may see your good works and praise your father in heaven. In a book by Ron Crawford called SEERS CATALOG, I read, “…the blood within our veins is composed of essentially the same qualities as that of light.” How easy does that reveal the reality of these scriptures? Moses went to the top of Mt. Sinai, face to face with God; Moses’ face shone. Later in Exodus 34:7 “Moses was 120 years old when he died, yet his eyes were not dim nor his strength gone.” Moses was called the friend of God. There is so much about this city on a hill that is about keeping intimacy with God. Ephesians 3: 8-12 “……that now the manifold wisdom of God might be made known by the church to the principalities and powers in the heavenly places”………….. The word “manifold” in its Greek origins means full of color, many shades, tints, hues and colorful expression (as stated in my book, Visual Encounters page 33). 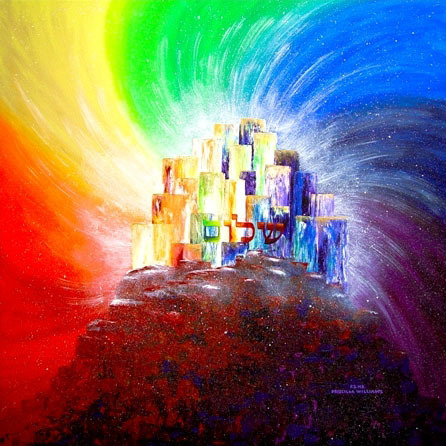 WE ARE TO BE THE FULL SPECTRUM OF GOD’S LIGHT TO ALL ON EARTH. The Hebrew letters spell shalom. The city on a hill has its foundation on the rock soaked in the Blood of Jesus Christ. The purple in the rock represents His royalty. It is vitally important that we see who we really are in Jesus Christ.